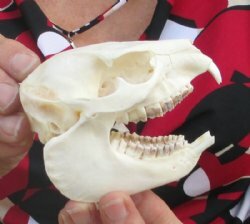 African hyrax skulls for sale, imported from South Africa, cleaned and ready for display and re-sale. Hyraxes (from the Greek hurax, "shrewmouse") are small, thickset, herbivorous mammals in the order Hyracoidea. Hyraxes are well-furred, rotund animals with short tails. Typically, they measure between 12 and 28 inches long and weigh between 4.4 and 11 pounds. They are often mistaken for rodents, but are more closely related to elephants. Four species are recognised; the rock hyrax (Procavia capensis), the yellow-spotted rock hyrax (Heterohyrax brucei), the western tree hyrax (Dendrohyrax dorsalis) and the southern tree hyrax (Dendrohyrax arboreus). Their distribution is limited to Africa and the Middle East.